Eukanuba Veterinary Diets Restricted Calorie for Cats is a dietetic complete pet food for cats, intended for the reduction of excessive body weight. It can also be used for cats that have mobility issues and who could benefit from weight loss. A wet version of this diet is available. 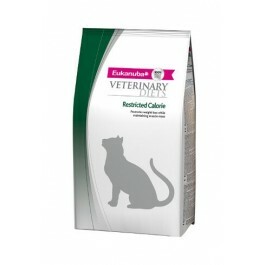 Eukanuba Veterinary Diets Restricted Calorie for Cats is intended for the reduction of excessive body weight. It is recommended that a veterinarian's opinion be sought before and during the use of this product in order to determine the needs of your cat. The Restricted Calorie for Cats diet is formulated with a low energy density and L-carnitine is incorporated for improved fat metabolism which helps to manage weight and achieve an ideal body composition. Glucosamine and chondroitin sulfate are also added to help support healthy cartilage in joints. Restricted Calorie for Cats should be fed until the target body weight is achieved, for any extended use please do consult your veterinarian. In addition, this diet provides all the nutrients needed to support the overall health and well-being of your cat. Feeding Instructions: It is recommended that a veterinarian's opinion be sought before use or before extending the period of use. Your veterinarian may suggest specific feeding instructions for your cat, or ask you to follow the standard portions shown in the feeding chart. Recommended time for use: until target body weight is achieved as established by your veterinarian. Water should be available at all times for your cat to drink.